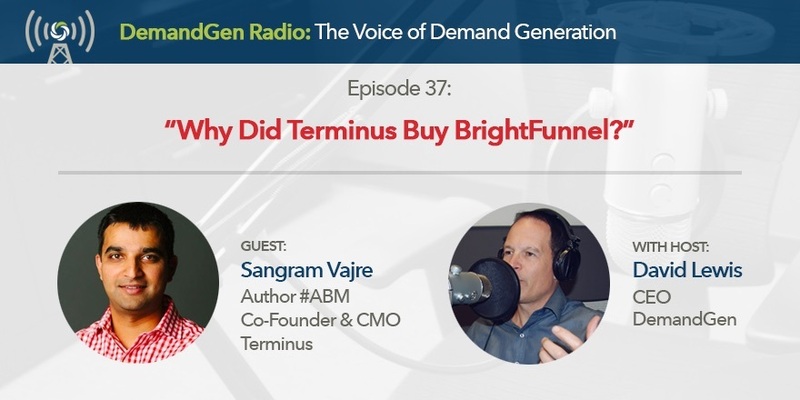 #37 Why Did Terminus Buy BrightFunnel? I bet you didn’t see that coming, did you? I didn’t either. Probably no one did. So why did Terminus, a startup, buy another startup? I ask Sangram Vajre, CMO of Terminus, that question and several others that you should hear his answers to. One of things you’ll hear is about the importance of being agile and moving in a direction despite having all your plans figured out. That’s a SUPER important lesson in life. What’s very unique about this acquisition is that it’s not a mega public software giant buying a smaller company. It’s two small martech companies coming together. That’s a first in the martech space. Will we see more? As a bonus, Sangram and I touch on the power of Podcasting and some other things we have in store for 2018. Have a GREAT 2018. Make this your best year yet personally and professionally.